The Goods and Service Tax (GST), to be implemented from July 1, would check tax evasion and ensure greater compliance by more tax payers, said Union Finance Minister Arun Jaitley on Monday. "The GST will make tax collection efficient, check evasion and help India have a tax-compliant society," asserted Jaitley after opening the new campus of the National Academy of Customs, Indirect Taxes and Narcotics (Nacin) in Bengaluru. The Rs 49-crore premier Academy will train officers of Customs, Central Board of Excise and Customs, Service Tax and VAT (Value Added Tax) to implement the GST regime in Karnataka and Kerala. Noting GST would require smooth coordination between tax officals of the Centre and states, he said he was sure that "this Academy will play an important role in its implementation". 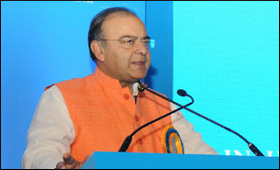 Noting that training academies like Nascin had a vital role in making the new tax regime citizen friendly and reducing red-tapism, Jaitley said the amalgamation of various indirect taxes under GST in one price is a monumental taxation change, which requires officers to upgrade their skills and knowledge, as it evolves while administering. Affirming that interaction between the assessing authority and taxpayer will minimise harassment and ensure greater accountability into the system, he said the GST Council had at its two-day meeting in Srinagar on May 19-20 decided on four tax rates -- 5 per cent, 12 per cent, 18 per cent and 28 per cent for services, including telecom, insurance, hotels and restaurants. "The rates for services are in line with those finalised for goods. Barring a few goods, including gold, rates of almost all good and services has been finalised for the July 1 rollout," added Jaitley. Central Board of Excise and Customs Chairperson Vanaja N Sarna and Member S. Ramesh were among the present at the inaugural event. The smart complex for training central and state government tax officials has six lecuture halls, a 250-seat auditorium, a residential hostel block with 100 rooms, sport facilities, including a swimming pool. "The Academy is equipped with two computer labs, an electronic library and infrastructure for holding virtual class room where faculties from across the country can conduct interactive classes," said Nacin Additional Director General D.P. Nagendra Kumar.